Home Can Bill Gates Stop Hurricanes? Microsoft co-founder Bill Gates has applied for patents to slow or stop hurricanes through the use of special barges to pump cool water from deep in the Gulf of Mexico to the surface. When the hurricanes hit the cooler water, the thinking goes, the hurricanes will dissolve. As reported in USA Today, if the patents are issued, they offer 18 years of legal rights to the idea for Gates and co-inventors, including climate scientist Ken Caldeira of the Carnegie Institution of Washington. For an overview of what they’re proposing, see the MSNBC video below. “Hurricane-Calming Technology? Bill Gates Has a Plan” (USA Today). 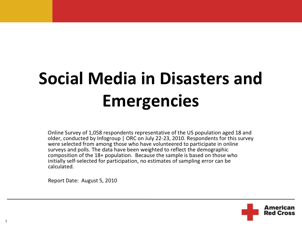 Are You Using Social Media for Emergency Management? Your Citizens Are!